At the half way point of the year, in terms of consolidated data releases, the picture for hedge funds at the top level looks okay – broad hedge fund indices are flat (e.g. the HFRI Asset Weighted Composite Index is up 1.35%), and flows have been positive (over $17bn in net subscriptions). However within the dull aggregate numbers there has been some noteworthy differential performance, as shown in the graphic below. 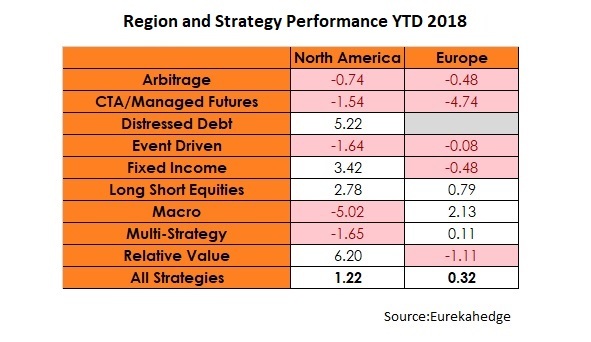 Going down the table of data from Eurekahedge the first striking investment strategy for differential performance comes in CTAs. American CTAs are down a bit with returns of -1.54% but European CTAs are down nearly 5% YTD. CTA managers in total have lost $19bn of investors’ money this year, and they are not happy. While short term performance of European CTAs has not be great, they have also posted losses on a 3- and 5-year basis. So recent performance has taken investors from watching digruntledly to action-point, but the medium-to-long term returns have set up that negative decision-making. A second strategy that is noteworthy for producing differential performance this year is global macro. Whilst European managers have produced a small positive return at the half way point of the year, with Brevan Howard doing particularly well, US-based managers have lost 5% of their investors money this year. To put this in context returns were dull (very low single digit) for the index of macro funds for each of the last three years. Investor flows have been much more positive than the returns would have merited in recent years: there was a small net inflow in 2015, a net outflow of $14bn from macro funds in 2016 and $8bn of inflows last year. This year, as the table below shows, macro funds (i.e. macro funds managed across the world) have in aggregate produced a small net loss, and taken in $13bn of new capital. Finally, the third investment strategy that is noteworthy is not so much about differential performance as flows. Net flows out of multi-strategy hedge funds were an eye-catching $18.6bn in the first half of 2018, during which time returns were a dull-but-not-poor -0.46% at the global index level. This is a staple strategy allocation for institutional investors in hedge funds as the strategy label is carried by some of the great brands of the hedge fund industry, the likes of Citadel, D.E.Shaw, Millennium and AQR. The multi-strat fund category is the second largest after long/short equities. 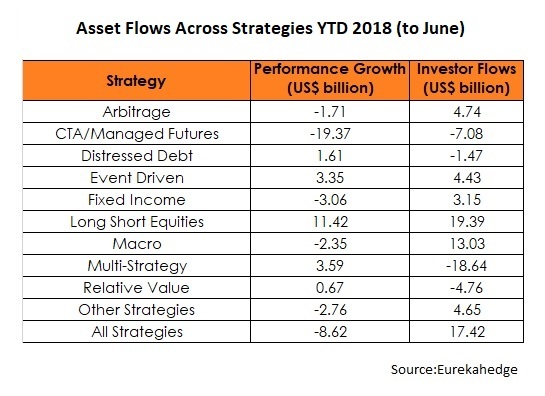 The redemptions represent 5% of the assets invested in multi-strat funds at the beginning of the year, or broadly equivalent to the added-value of the strategy over the last 3 years.